The Pan-American Highway was created by the USA to improve road communications within the Western Hemisphere post-WW2. The highway started at the Mexican border and eventually reached somewhere south of Santiago in Chile. It was a vote-buying gimmick by the Americans to fund allies, but it also created an essential spine road through Central America to the Darien Gap and along the west coast of South America to the then-limits of Chile. Driving the Pan-Am has become a travel experience. More recently, the improvement in more northerly highways, such as the Dalton Highway from Fairbanks to Prudhoe Bay in Alaska, the paving of most of the Stewart Highway through British Columbia, and the tremendous improvement in highway infrastructure in Mexico over the past two decades, has made possible the long-awaited Panamericana Adventure Highway. Stretching from the Arctic Ocean at Prudhoe Bay south to the famous Alaska Highway, then east into Canada s Yukon, the Panamericana takes a westerly route along the coast and an easterly route through Edmonton and south to Texas. The western route is more interesting, in that much of it runs through pristine mountain wilderness. 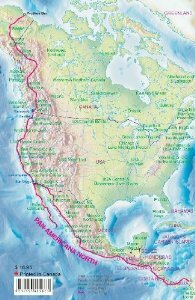 We have chosen the western route for this atlas, following the Pacific Coast as closely as possible through BC, Washington/Oregon/California to Tijuana. From here, the route can follow south through Baja California or head east and south along the eastern side of the Gulf of Colorado, past Mazatlan and Acapulco to join the original Pan-American at the Guatemala border. From Guatemala south to Panama, the Panamericana North (or Norte) is the original and well-maintained Pa-Am.